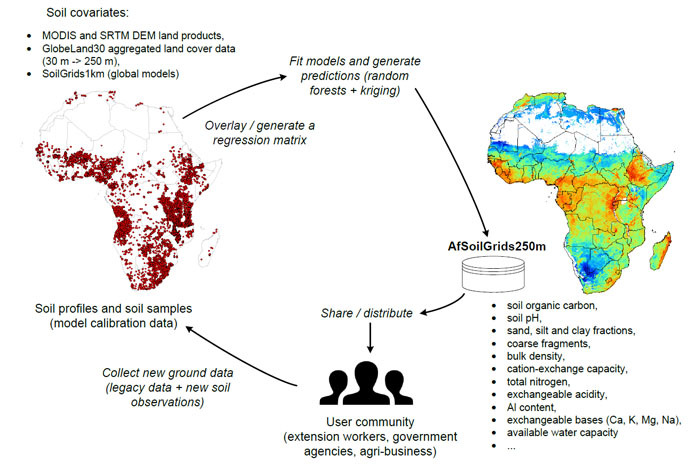 The AfSoilGrids250m maps were produced using an automated system for soil mapping and make use of ISRIC’s Global Soil Information Facilities framework. Spatial predictions have been generated using a combination of random forests and geostatistics (see scheme). In this framework, accuracy of predictions is constantly improved as the new data arrives (hence predictions are constantly updated in any automated system). At the heart of this crowdsourcing system is the user community that contributes new ground observations and rates the content and validates predictions. Results of the accuracy assessment of AfSoilGrids250m, have been reported in the PLOS One article (under review). Africa is now among first continents in the world for which free-access high resolution 3D soil property maps are available.